نیٹو کی تعیناتی-امن معاہدے کی نگرانی کے لیے. Figures represent all deaths directly attributable to war conditions, not counting non-violent deaths. a From 1992 to 1994, the Republic of Bosnia and Herzegovina was not supported by the majority of Bosnian Croats and Serbs (who each had their own hostile entities). Consequently, it represented mainly the Bosniak (Bosnian Muslim) ethnic group in Bosnia and Herzegovina itself. The post-war بوسنیا و ہرزیگووینا encompasses all three بوسنیائی ethnic groups. b Between 1994 and 1995, the Republic of Bosnia and Herzegovina was supported by, and represented, both ethnic Bosniaks and Bosnian Croats. This was primarily because of the Washington Agreement. ↑ Sumantra Bose۔ Contested lands: Israel-Palestine, Kashmir, Bosnia, Cyprus, and Sri Lanka۔ Harvard University Press۔ صفحہ 124۔ مورخہ 6 جنوری 2019 کو اصل سے آرکائیو شدہ۔ After the official referendum the United States took the lead in sponsoring international recognition for Bosnia as a sovereign state, which was formalized in 6 April 1992. 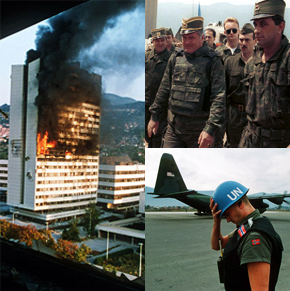 The Bosnian War began the same day.